I think “Let’s Go Panhandling” really says it all. Wow, Cheese Whiz, spaghetti, and hot dogs. That is quite the concoction! This is like everything that little kids like to eat shoved into one recipe. Ha ha, glad you love the blog, Julie!! Some of the vintage recipes really are amazing, aren’t they? I’ve been trying to find an original recipe like this. My grandmother use to make it. Its similar to this, but no mustard. we use a can of tomatoes instead. Sounds gross? yes. One of the few recipes my picky kids will eat!!! 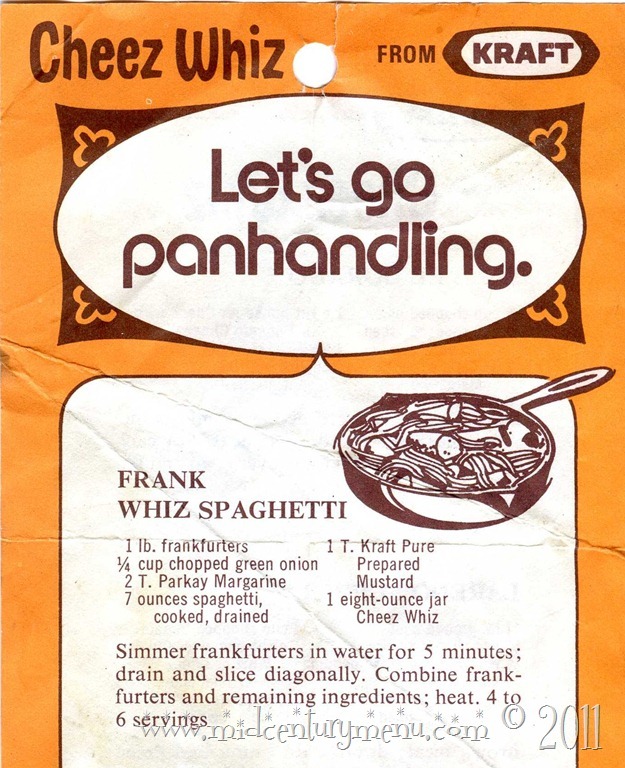 Frank Whiz Spaghetti! That almost dethrones Jiffy Cheesefurters as my favorite mid-century recipe name.